The story of Undine was an extremely popular children's story in the 19th century, although it is not one which recommends itself to today's parents. * Louisa May Alcott mentioned it in Little Women, and Charlotte Yonge references it in one of her collections of stories. Yonge also wrote the introduction to it in one edition. Briefly, Undine is a water sprite, unwittingly fostered by a sweet Christian pair of elderly parents. As a water-sprite, Undine is not evil, but she has no soul, which means she has no experience of the pain which causes humans to empathize with one other. Her bewildered human parents are unaware that she is not a human. They love her but are much troubled by her thoughtless, careless ways. She is affectionate but willful and self centered, unable to empathize with others, unconcerned with how her selfish antics grieve her family. She falls in love with a passing knight and he with her, and their union, consecrated in marriage, grants her a soul, instantly giving her a gravitas and depth of patience and human kindness that opens her eyes to the suffering she has caused and the good that is open to her in the world. It reminds me very much of the George MacDonald story The Light Princess, which I won't summarize because it simply must be read. At any rate, Undine's light and careless (and so often thoughtlessly wounding) affection is awakened, made deeper, stretched, and given real meaning when love imbibes her with a soul. Mason uses this highly popular and very familiar story as a sort of a hook with which to open her sixth volume on education. "It would seem a far cry from Undine [by La Motte Fouque] to a 'liberal education' but there is a point of contact between the two; a soul awoke within a water-sprite at the touch of love; so, I have to tell of the awakening of a 'general soul' at the touch of knowledge. Eight years ago the 'soul' of a class of children in a mining village school awoke simultaneously at this magic touch and has remained awake. We know that religion can awaken souls, that love makes a new man, that the call of a vocation may do it, and in the age of the Renaissance, men's souls, the general soul, awoke to knowledge: but this appeal rarely reaches the modern soul; and, notwithstanding the pleasantness attending lessons and marks (grades and one's gpa) in all our schools, I believe the ardour for knowledge in the children of this mining village is a phenomenon that indicates new possibilities. Already many thousands of the children of the Empire had experienced this intellectual conversion, but they were the children of educated persons. To find that the children of a mining population were equally responsive seemed to open a new hope for the world. It may be that the souls of all children are waiting for the call of knowledge to awaken them to delightful living. This is how the late Mrs. Francis Steinthal, who was the happy instigator of the movement in Council Schools, wrote,––"Think of the meaning of this in the lives of the children,––disciplined lives, and no lawless strikes, justice, an end to class warfare, developed intellects, and no market for trashy and corrupt literature! We shall, or rather they will, live in a redeemed world." This was written in a moment of enthusiasm on hearing that a certain County Council had accepted a scheme of work for this pioneer school; enthusiasm sees in advance the fields white to the harvest, but indeed the event is likely to justify high expectations. Though less than nine years have passed since that pioneer school made the bold attempt, already many thousands of children working under numerous County Councils are finding that "Studies serve for delight." No doubt children are well taught and happy in their lessons as things are, and this was specially true of the school in question; yet both teachers and children find an immeasurable difference between the casual interest roused by marks, pleasing oral lessons and other school devices, and the sort of steady avidity for knowledge that comes with the awakened soul. The children have converted the school inspectors: "And the English!" said one of these in astonishment as he listened to their long, graphic, dramatic narrations of what they had heard. During the last thirty years we (including many fellow workers) have had thousands of children, in our schoolrooms, home and other, working on the lines of Dean Colet's prayer for St Paul's School,––"Pray for the children to prosper in good life and good literature;" probably all children so taught grow up with such principles and pursuits as make for happy and useful citizenship. simple to commend themselves to the 'general.' Yet these principles and methods make education entirely effectual. Read the above, look up any words that aren't clear, and spend a couple minutes either writing or telling as much of it as you can recall. Here are a couple of mine: 1. 'Pleasantness' over lessons vs Ardour for knowledge; casual interest vs steady avidity for knowledge. Undine's awakened soul allowed her to really understand, for the first time, how other people felt, to care about them in a meaningful way, to see things from their point of view, and no longer to put her own way of thinking first and foremost. 1. Go outside with the kids at least once this week- take a walk in your neighbourhood, or visit a park, a farm, a garden (does a neighbour have one?) or a plant nursery. Just enjoy it- walk along and look for something pretty or interesting to admire or be curious about. 2. Sing aloud at least twice this week (more is better, but this is the minimum). Said, 'Pray, which leg goes after which? Are you overthinking your week? Read something good to your children. Sing with them. Take them outside. Ask them to narrate the good books and stories you read. Nourish their bodies and their minds, starting with with what you have and where you are. *footnote and spoiler alert: to be honest, the story of Undine doesn't end well, as not every human with a soul is as awakened to our duties and responsibilities to one another and the way of love as Undine. Think Little Mermaid except the betrayal by the beloved is deliberate and the Mermaid is the cause of death to the unworthy human husband. We're doing Year 7 right now, so the first thing I do is go to that page and print the booklists (with the footnotes) and read through everything. I use this to determine what books we own and what we need and order all the books. That can be fun. 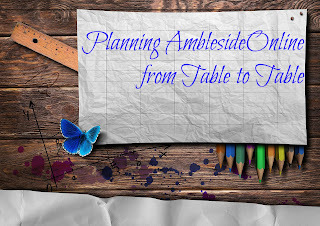 I try to do this a little ahead of when I'm going to be planning - so a week or two before I'm planning to plan. Then I have these beautiful stacks of books. For Year 7, I knew I'd be doing some adjustments for R-girl, so I printed both the Detailed and Basic/Lite version. This year, I pulled out some things that were going to be done with Jason and some things that were going to be done during our Morning Time, Whatchamacallit, and left the rest in the main block. You can see where there are blank rows as separators. 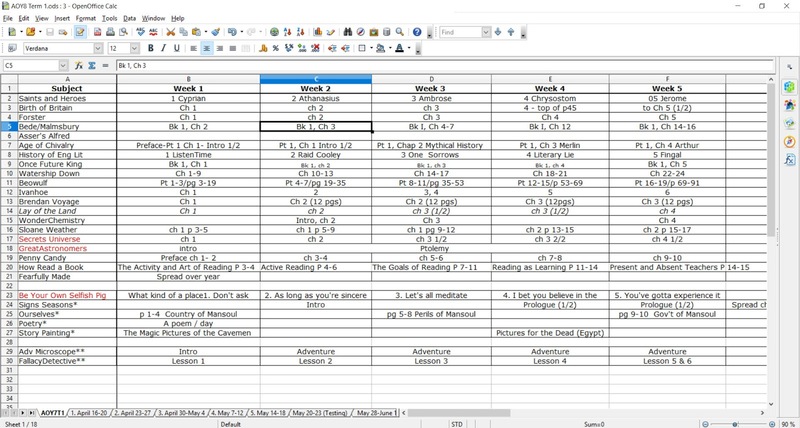 Once I've determined how we're going to approach the work, I create a separate spreadsheet for each week (you can see them across the bottom of the page) and put the week number and the dates for that week number). 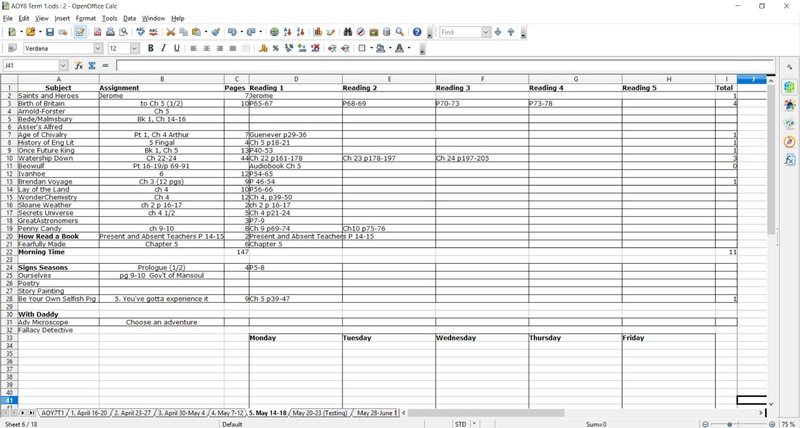 Then I copy the subject column to each of those tabs and the assignments for that particular week to the tab. So the column headed Week 2 went on the tab named "2 April 23-27." 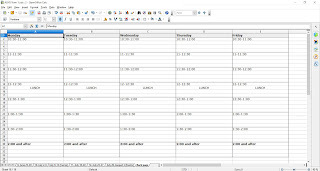 I made a separate spreadsheet for all twelve weeks (plus break weeks). Each week's tab looks something like the above. I then split out the reading that is assigned to, at maximum, 5 readings per week. Because I have them, I use the books as I'm doing this and some of them I'll put a small (in pencil) star where I want them to stop for the day. I put the total number of pages assigned in a column and I have a column at the end for the count of readings for each book. That count is summed. In this case, there are 25 independent readings for the week. I don't count those that will be done in Morning Time or with Daddy. 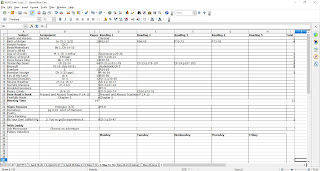 I can then print that week's tab for them - I do hide the column that has the whole weekly reading assignment, and just give them the split up readings. 25 readings is easy to deal with - they can do 5 per day. They don't have to do any on Wednesday (except we generally do Ivanhoe and Beowulf as audiobooks on Wednesday), but they generally choose to in order to cut down the assignments on the other days. On Monday, they write the assignments in the daily boxes at the bottom of the sheet. 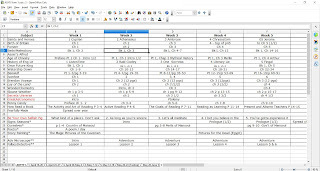 This helps them learn to evaluate a week's worth of work and divide it reasonably. We've worked hard to see how doing a little bit every day is better than cramming too much into any given day. We've looked at how that page number column comes into play. Some day, I hope to hand them the week's assignments and they'll split out the readings, but that day is not yet. This is the newest step and one we've done for a little more than a term, so it may not stay the same. So far it has worked beautifully. 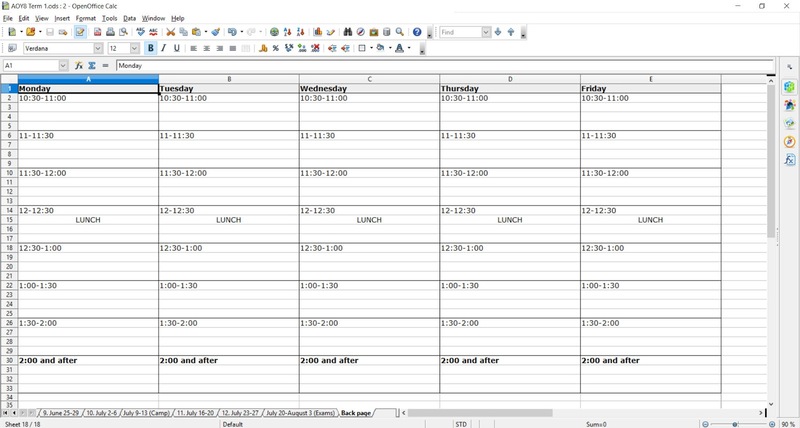 Because we have one set of books for three students, a standard timetable schedule is a nightmare. Also a nightmare: lessons that take all day because there's no sense of urgency or accountability. This system was borne of sheer desperation. We do Whatchamacallit from 8:30-10:15. After a 15 minute break, the independent work portion of our day begins. I have a duplexing printer, so I print the above form on the back of their weekly assignment page. Each day, the children take the book list they have made for the day, Math, Latin, a written narration, and penmanship and assign the work to half-hours. Some things take a full half hour, some don't. They have to be careful with the different books and assign them in appropriate blocks. They have to plan if they're going to read with someone else, or that they don't plan the same books at the same time. It takes some juggling and thought. I love it. So far, it has worked well, with just a few growing pains. It fits with my general philosophy of helping them learn to manage their own workload so they can be independent. Now, I can start the pre-reading. It's plenty of work, but it's good work. 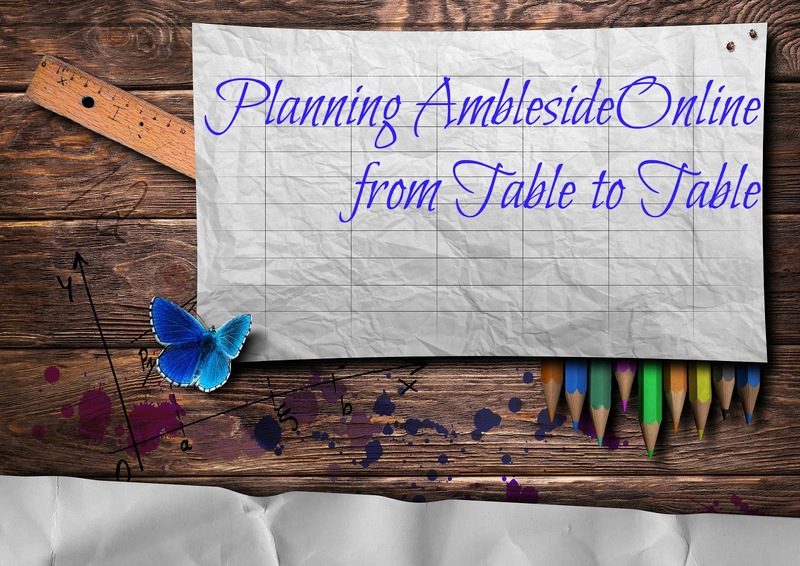 So, there you go - from AO and their weekly table to the individual day's table how we're planning AmblesideOnline at this time. collaborator of the CharlotteMasonIRL account on Instagram. She homeschools her three children in Central Ohio.